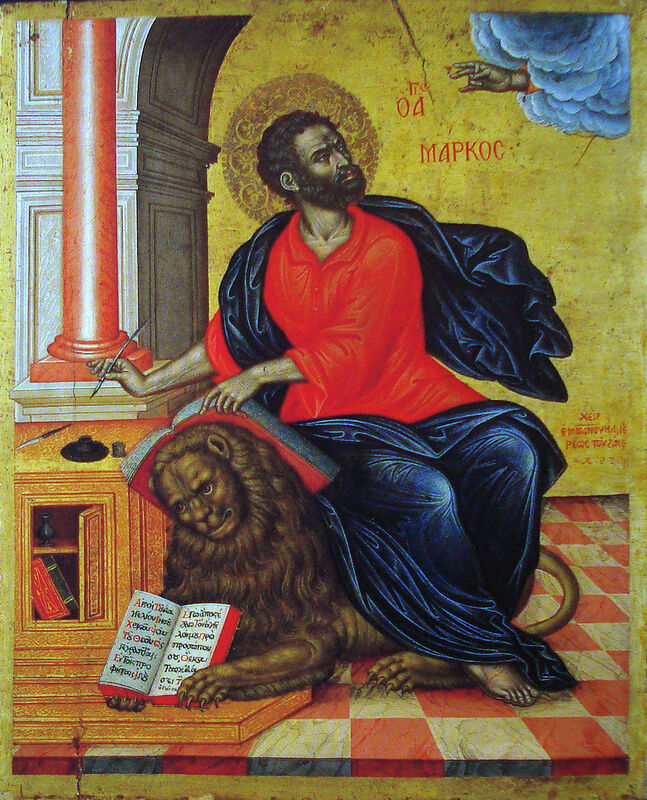 Today the church honors and remembers St. Mark, Evangelist, generally regarded as the author of the gospel which bears his name. Last week we provided you a brief summary of his life and a recipe to make in his honor. In seminary I was taught that the Gospel according to Mark was probably the first gospel ever written. It’s hard to imagine, so many years later, that someone had to be the first person to put pen to scroll and record the stories about Jesus. What a daunting task! Without the inspiration of the Holy Spirit it would have been impossible. The icon below depicts Mark, who may have come from North Africa. He is clearly looking to God for wisdom; he is ready to write Christ’s story. Below him is his symbol the lion, holding an open book, demonstrating that these words are for the whole world. The first apostles and evangelists were human beings empowered with the Holy Spirit. So are we. We may not be called to write the first recorded gospel. But we continue the tradition of those who did. In our words and in our deeds, may we continue to tell the story of Jesus. It is said that Mark received his knowledge about Jesus from St. Peter’s teaching. Even this great evangelist had to be taught by someone. Now we who read his Gospel receive the gift of this heritage: a gift to pass on. Whom are you teaching about Jesus? Who is teaching you? “In our words and in our deeds, may we continue to tell the story of Jesus.” I continually find this to be the greatest challenge I’m faced with as a follower of Jesus, and the one that I so frequently fail at. You are not alone! I put it out there because I fail at it so frequently myself. Fortunately God is full of mercy. I have, and try to remind myself of that daily. We all fail at it but but because of God’s mercy and grace, we have a new chance each day to change that.